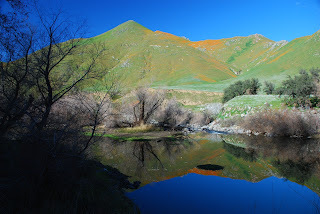 The Kern River Valley hosts one of the most beautiful wildflower shows every year. Thanks to the heavy rainfall we received in late February, all sorts of wildflowers are beginning to pop up all over the surrounding hills. A prime viewing location for these flowers is the scenic drive up the Kern River canyon on highway 178 heading east out of Bakersfield. Several of the Kern River Outfitters’ staff members have been hiking and mountain biking the popular Kern Canyon trail to see the hills covered in almost every color of the rainbow. California Poppies, Goldfields, Indian Paintbrush, Baby Blue Eyes, Fiddlenecks, and Lupine have made their way into thousands of acres along the banks and mountainsides of the Upper and Lower Kern River. The mass spectacle of the wildflowers is a sure sign that the southern Californian whitewater rafting season on the Kern River will be one for the books. As the low elevation snow starts to melt with the upcoming warm weather, be sure to check out a second wildflower show in the high sierra gateway to the Forks of the Kern.